These are either made of Rubber or a Flexible Plastic similar to a sticker (see item description). Stencil in with Henna Paste. 4) Lastly, remove the Stencil when the Henna paste has Dried. NOTE: The Rubber Stencils can be used multiple times. The Flexible/Plastic Sticker Stencils are intended for one time use. 10 Misc. 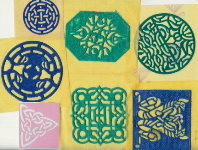 General Rubber/Plastic Stencils For Henna. 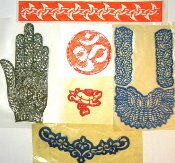 Ten General Self Adhesive/Reuseable Rubber/Plastic Adhesive Stencils used to make Henna Tattoos. 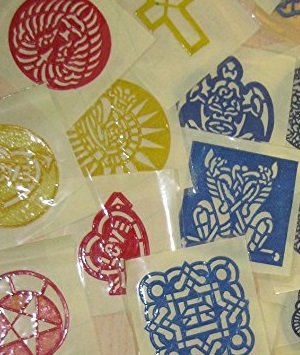 These are Self Adhesive Flexible Plastic Stencils Intended for one time use and used to make a Henna Tattoo around the Navel or on the Shoulder. 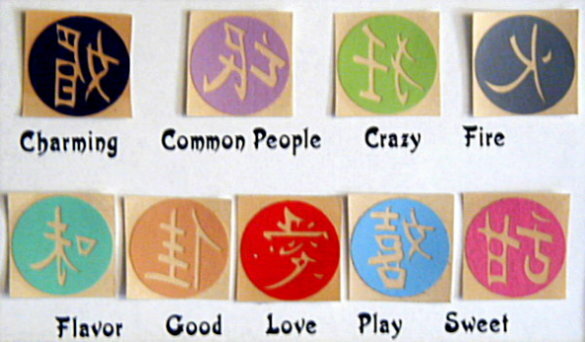 This is a pack of Nine Self Adhesive Flexible Plastic Stencils Intended for one time for use in making Henna Tattoos. Self Adhesive/Reuseable Rubber Adhesive Stencil used to make a Henna Tattoo on the Lower Back or Chest. This Henna Tattoo Stencil has a Barbwire Like Pattern to it - It's Self Adhesive, Made of Rubber, & Reuseable - This stencil can be used around the Arm, Wrist, or Ankle. NOTE: Click Thumbnail Image or Here to view larger Photo of Stencil. This Spiral/Celtic Patterned Stencil is Self Adhesive, Made of Flexible Plastic, and Intended for one time use in making a Henna Tattoo on the Arm, Wrist, Ankle etc.... NOTE: Click Thumbnail Image or Here to view larger Photo of Stencil. 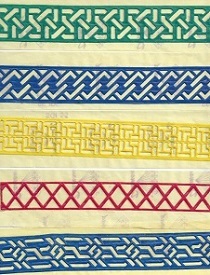 This is a another Self Adhesive Stencil which is Self Adhesive, Made of Flexible Plastic, and Intended for one time use in making a Henna Tattoo around the Arm, Wrist, or Ankle. NOTE: Click Thumbnail Image or Here to view larger Photo of Stencil. Self Adhesive, Rubber, & Reuseable and can be used around the Arm, Wrist, or Ankle. NOTE: Click Thumbnail Image or Here to view larger Photo of Stencil. Self Adhesive, Rubber, & Reuseable - The Stencil can be used around the Arm, Wrist, or Ankle. NOTE: Click Thumbnail Image or Here to view larger Photo of Stencil. Set of Five Random Armband Stencils - They are Self Adhesive, Rubber, & Reuseable - The Stencil can be used around the Arm, Wrist, or Ankle. NOTE: Click Thumbnail Image or Here to view larger Photo of Stencil. These 2 Stencils are a mix of the Plastic (frog) and Flexible Rubber (gecko). Both are Self Adhesive, & can be used to make Henna Tattoos. These 2 Butterflies are Self Adhesive, Made of Thin Paper like Plastic, and Intended for one time use in making a Henna Tattoo. These Dragons are Self Adhesive, Made of Thin Paper like Plastic, & Intended for one time use in making a Henna Tattoo. These 2 Flower Stencils are made of Thin Paper like Plastic, Self Adhesive, & Intended for one time use in making a Henna Tattoo. These Dolphins are Self Adhesive, Made of Thin Paper like Plastic, and Intended for one time use in making a Henna Tattoo. This is a really nice Stencil of a Winged Angel and a Cross. The Stencils are a mix of the Thin Paper like Plastic (angel) and Flexible Rubber (cross), Both are Self Adhesive, & can be used to make Henna Tattoos. These Scorpian and Snake Stencils are Self Adhesive, Made of Thin Paper like Plastic, & Intended for one time use in making Henna Tattoos. Both of these Stencils are made of Rubber, Self Adhesive & Reuseable. The Stencils can be used to make Henna Tattoos again and again.. Both of these Stencils are made of Rubber, Self Adhesive & Reuseable. The Stencils can be used to make Henna Tattoos again and again. 3 Stencils with more Traditional Paisley Shaped Henna Patterns - they are Self Adhesive, Rubber, & Reuseable. This is the King of the Jungle Set. One Stencil is of a Lion Head and the other is a Crown. Both are Self Adhesive, Made of Flexible Rubber, & Reuseable. These are some Native American Rubber Stencils, one is a Turtle & the Other is a Mask/Warrior. Both Stencils are Self Adhesive, Rubber, & Reuseable. Make cool Henna Tattoos with this pack of 6 Celtic Stencils. The Stencils are Self Adhesive, Made of Flexible Plastic, & Intended for one time use in making Henna Tattoos. NOTE: Click Thumbnail Image or Here to view larger Photo of Celtic Stencils. Make Some Cool Tribal Henna Tattoos with this pack of 5 Self Adhesive Stencils made of Thin Paper like Plastic and Intended for one time use in making Henna Tattoos. NOTE: Click Thumbnail Image or Here to view larger Photo of Tribal Stencils. Use these to make Zodiac Henna Tattoos. The Stencils Have an Adhesive Backing, are made of Rubber, and are Reuseable. This is a Stencil Set made from Odds & Ends - Every order is different but will contain 6 stencils - One for the Foot, One for the Hand, One to be used for a Armband or Ankleband, One for the Lower Back or Chest, Plus one Round Stencil, & One General Stencil. NOTE: Click Thumbnail Image or Here to view larger Photo of Odds & Ends Stencil Set.